iPad to Gold? ThinkPad to Silver? Huawei to Bronze? That is the hope of the Japanese Olympic committee, taking waste electronics and transforming them into one of sports ultimate prizes. The country has long been a leader in the area of material recovery with advanced extended producer responsibility policies and an early focus on engaging consumers in collection schemes. As an island with little natural resources, recycling and “urban mining” are seen as important ways to maintain domestic resources. Electronics items contain myriad natural resources and successful isolation of them can yield precious secondary materials. 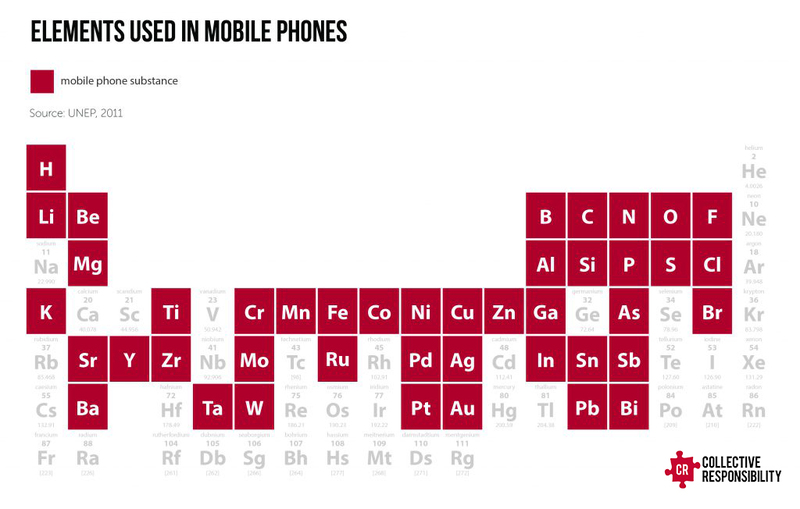 In the case of mobile phones, the number of elements is as high as 43, as highlighted in the graphic below. The high profile move from the country will hopefully spark a wider debate about the potential for e-waste as a source of precious metals. E-waste is one of the fastest growing waste streams and in China it is causing growing environmental and social issues in areas of the country. These problems are intensified due to the incentive for informal reclamation, as isolating of the above can yield considerable financial gains. However, safe and successful recovery of these materials is possible with new technologies in the sphere growing. The problem with the “formal” reclamation process is that environmental mitigation technology is often the most expensive in the material recovery process and as a result the incentive to process through informal channels is high. At Collective we were fortunate to recently visit TES-AMM Shanghai, a Singaporean based e-waste processing company with facilities throughout China. They are experiencing larger and larger volumes of e-waste to their factory and have been aided by the introduction of the WEEE legislation (Waste Electrical and Electronic Equipment). The WEEE legislation in China is helping companies in the area as it provides incentives for consumer to trade in their old electronics. This has resulted in an growth in collection of the goods under the policy, which includes household waste from refrigerators to television, and has increased collection and formal processing in the sector. However, the 3C electronics are yet to be included within this framework, meaning that no incentive is provided to the consumer. So yes, China is making great strides to increase collection and move towards a sector with greater formal dominance, but there is still a long way to go in creating a full shift. The 3C goods must be addressed to create greater sector wide collection. Hopefully, the high profile move from Japan in an area of sport that many nations hold dear will raise the profile and potential for e-waste collection and reclamation. Tags: government, informal recycling, technology, waste.